But there are some words that are always ready for me. 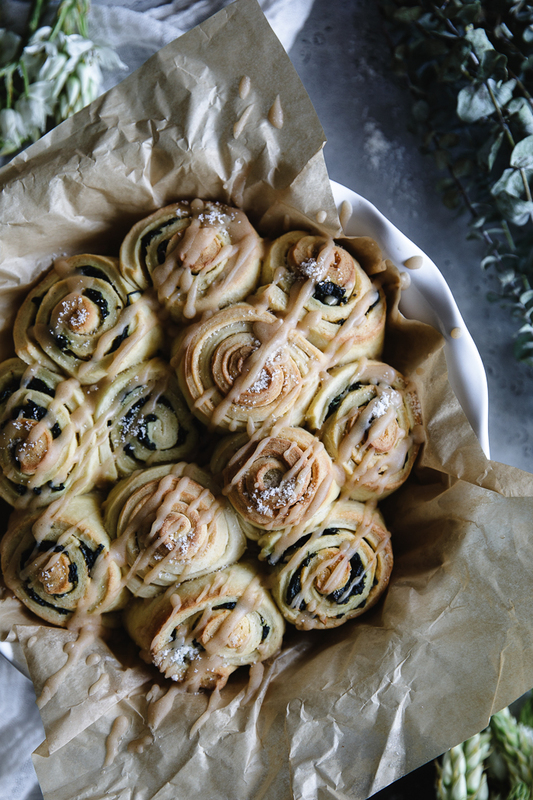 Delicious and amazing are two of them, and they are what I just need to describe these sweet and savory spinach, garlic and maple rolls. This is the kind of dish that you rediscover every time you make it. When you take that first bite is like you are tasting it for the first time, and a smile just draws into your face because you are realizing how good that recipe is. This is definitely a make ahead recipe. Ideal for you to start making it on a Saturday afternoon so you can relax on Sunday morning by doing practically nothing; just bake them and serve! With what other fillings would you love to see these beauties? 1. When baking in general, but especially yeasted doughs, it’s very important to have all your ingredients at room temperature. This will help greatly with the development of the gluten. 2. When stretching the dough, remember to always stretch from the center outwards; center back, center forth, center right and center left. 3. You may substitute the pistachios for pine nuts. To make the dough: Pour the water in the bowl of a standup mixer. Sprinkle the yeast on top and allow it to bloom for a few minutes, then whisk until smooth. Whisk in ½ cup of the flour. Cover the bowl with a plastic wrap and let it stand for 30 minutes. Return and secure the bowl to the standup mixer. Add the remaining flour, eggs, sugar and salt. Fit the mixer with the hook attachment and knead in medium speed (4 in the Kitchen Aid) for 4 minutes. Add the room temperature butter, a few pieces at a time, and knead 1 to 2 minutes more, until the butter has incorporated. Reduce the speed to low (“stir” or 1) and knead for 12 minutes. Unhook the dough and cover the bowl with plastic paper. Let it stand for 2 hours in a warm corner, until it has doubled its size. To make the filling: In the meantime prepare the filling. Mix the butter with the sugar and set aside. In a medium skillet heat the oil in medium heat and then add the spinach. Sprinkle with the salt and sauté for 2 to 3 minutes, until the spinach is almost wilted. Add the garlic and the pistachios and mix. Pour the maple syrup and mix once more. Retire from heat and set aside. Putting everything together: Sprinkle a clean flat surface with some flour and transfer the dough to it. Sprinkle just a bit of flour on your rolling pin as well and start stretching the dough until you have a 10” x 15” sheet (see notes). Using a pizza cutter or very sharp chef’s or pairing knife cut the edges to make it straight. Spread through the dough the mixture of butter and sugar first, then the spinach mixture, without the excess of olive oil. Starting from the longest side near to you, roll up the dough and pinch the seam together. Using a sharp knife cut 1 ½” rolls. Place them in a deep baking dish already buttered or covered with parchment paper. Cover with plastic paper and place in the fridge overnight. The following day, take the rolls out of the fridge and let them proof for one hour before baking. Preheat oven to 350°. Bake for about 30 minutes. Take them out of the oven and let them cool down. While the rolls are cooling, heat in medium heat the maple syrup with the butter until gently simmering. Retire from heat and add the confectioner’s sugar while whisking the syrup. Return to heat and cook for a few minutes more, until the sugar has completely dissolved. Retire form heat and pour immediately over the rolls. Let everything cool down for several minutes before serving.